Lyme Blood Tests Now Available At Home! Exposed To Lyme? COPPE Laboratory’s At Home Lyme Disease Blood Test Can Help. 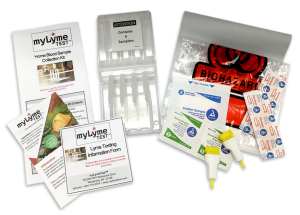 The myLymeTest is an AT-HOME Lyme disease test collection kit designed to provide you with information about your exposure to Lyme disease. Lyme disease is diagnosed with a blood test – early detection and treatment helps prevent complications like Lyme arthritis and meningitis. All the test requires is a simple fingerstick and a few drops of blood. Get results sent directly to you within 10 days or less! The myLymeTest kit is easy to use from the comfort of your own home. The sample collection kit will arrive a few days after you order it online or by phone. One myLymeTest kit costs $149.95, which includes prepaid postage and laboratory testing fees. No doctor visits required, and no hidden costs! Once our laboratory receives the sample, testing is performed and results are available in less than 10 business days! Blood testing is performed by COPPE Laboratories, a CLIA-certified medical laboratory in Waukesha, Wisconsin. We specialize in developing fast and accurate Lyme disease blood tests. If you have questions about ordering myLymeTest, please give us a call at 1-844-774-5074. Our laboratory staff is happy to answer any questions you have! Your test is performed in a US, CLIA-approved laboratory. A CLIA-certified lab must meet certain quality standards, including qualifications for individuals who perform the test and other standards that ensure the accuracy and reliability of results.